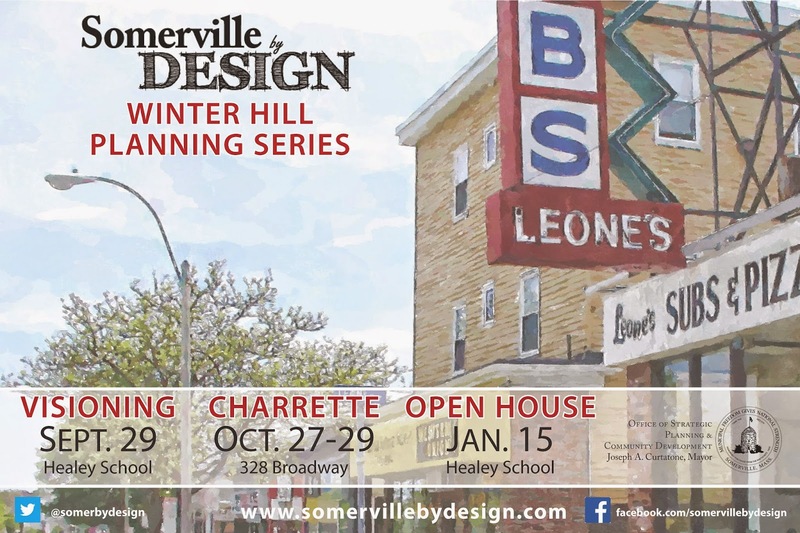 Somerville by Design will be hosting a series focusing on Winter Hill starting this Fall that will include a visioning session, "open studio" charrette, and ending with an "open house" in January. In an email, Somerville by Design writes, "We are pleased to announce the fall and winter schedule for the "Somerville by Design" neighborhood planning effort in Winter Hill. This fun, participatory process has been very successful in neighborhoods like Gilman Square, Lowell Street, East Somerville and Davis Square. Over the next four months, residents, business owners, community organizations and commercial property owners will be rolling up their sleeves with City officials to prepare a plan that guides public and private investment in the Winter Hill neighborhood, from Mystic Avenue to Medford Street, and from Foss Park to Magoun Square. From October 27th to 29th, we will hold an "open studio" event in the vacant storefront at 328 Broadway (former MetroPCS location). For three days straight, from 9am to 9pm, you can drop in at the studio and work with City staff and designers to draw and discuss ideas about the future of the neighborhood. Green space, jobs and housing, business development, traffic management, arts and culture: it's all on the table. We will work together to generate as many ideas as possible, and at a "Pin-Up Presentation" on October 29th, we will ask you to select the ones that are worth keeping, the ones that need more work, and the ones that should be thrown out. During the early winter we'll take what we've heard and refine it, and come back for an open-house presentation in mid-January." For more information and to see studies of other Somerville locations, check out the Somerville by Design website!